The purpose of an alarm system is to inform about detecting various types of dangers. Its main goal is to inform about an unauthorised intrusion into a protected area. Additionally, such a system may warn premises owners about, e.g. the presence of smoke or water leaks. Using alarm sirens is one of the basic methods to achieve this goal. Alarm sirens come in two types, i.e. 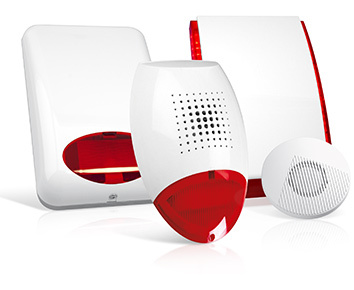 indoor sirens and outdoor sirens. This division mostly results from their installation locations, technological solutions provided and design. 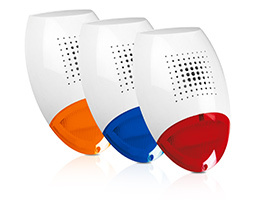 A siren shape and colour may be selected individually. In this case, the available extensive range of such devices facilitates selection of a product harmoniously adjusted to the architecture of the building on whose facade it will be mounted. Each of these groups provides different combinations of signalling forms (sound and/or light) which are to inform the surroundings about a given event. An important role played by outdoor sirens mounted outside a protected area is to scare off potential intruders. Available statistics clearly show that purchasing an alarm system is one of the most effective methods to avoid uninvited guests. The presence of a siren informs a potential burglar about the fact that a given facility is protected by an alarm system, which makes a potential burglary more risky. As far as outdoor sirens are concerned, the main differences are connected with their power supply systems. Simpler sirens are activated by inputting power supply directly from a control output of a control panel. 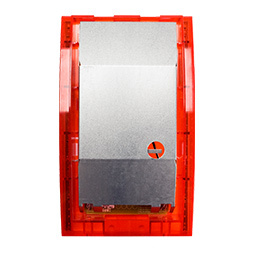 More advanced devices are equipped with a battery ensuring independent operation even after they are disconnected from an alarm installation. 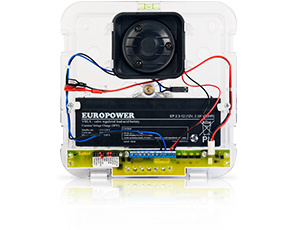 Sirens with own power supply should be used mostly in locations where potential intruders' access to the siren or its wiring is not sufficiently limited. As far as acoustic signalling is concerned, two popular solutions are used. Sirens fitted with piezo-acoustic transducers emit disturbing high-frequency and high-intensity sounds. However, if the device is installed in a location characterised by high noise intensity, sirens equipped with a dynamic tube transducer may be a better solution. Their characteristics include more penetrating sounds attracting the required attention in noisy surroundings. As far as optical signalling is concerned, not long ago, different designs were used, i.e. from the simplest signalling by means of simple electric bulbs to flash discharge lamps. Presently, LEDs have been used most commonly as they combine advantages of these both solutions, i.e. reliability and perfect effectiveness. SATEL sirens enclosures are made of plastic. This ensures not only their more attractive appearance in comparison with other materials, but also longer life cycles. One must remember that not all materials are suitable for application in different weather conditions. Sirens may be exposed to high and low temperatures, strong winds, humidity or UV radiation. However, these devices must be resistant not only to environmental impacts, but also intended actions aimed at their damaging. 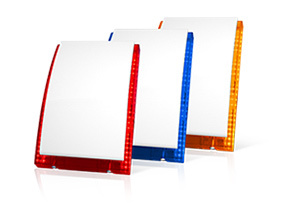 SATEL sirens are manufactured with the use of polycarbonate. Its resistance parameters, i.e. mechanical strength or resistance to high and low temperatures, meet the stringent requirements for modern alarm sirens. The mechanical design of sirens also includes tamper protection solutions. 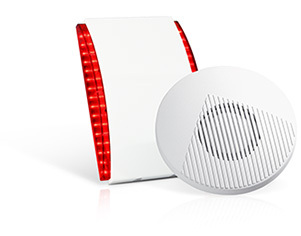 Each offered siren is equipped with sensors protecting it against opening or removing from a mounting surface. Additionally, some sirens are capable of detecting an attempt of neutralising them with fitting foam. The tamper protection is enhanced by internal metal shields protecting electronic elements against damage with the use of force. Indoor sirens play a different role. Their main task it to "stun" an intruder by means of high-intensity sounds. Indoor siren enclosures are smaller and the electronic systems used do not require protection against environmental conditions. In certain situations both optical and acoustic signalling is important inside buildings. An example of such a situation may be a siren connected to an alarm system in a shop located within a shopping centre or installed on a staircase as an element of an alarm system in a flat. In such cases, users may choose an indoor siren with an additional optical signalling feature facilitating identification of the location in which danger has been detected. Additionally, if such a siren allows unauthorised access, a model with own power supply may be selected so that the signalling feature is active even after the siren is fully cut off from the installation.